Foreshadow is the word provided by the photo challenge this week. The photo I have chosen was taken in Cambodia. The colour of the water shows the paradise we were in. 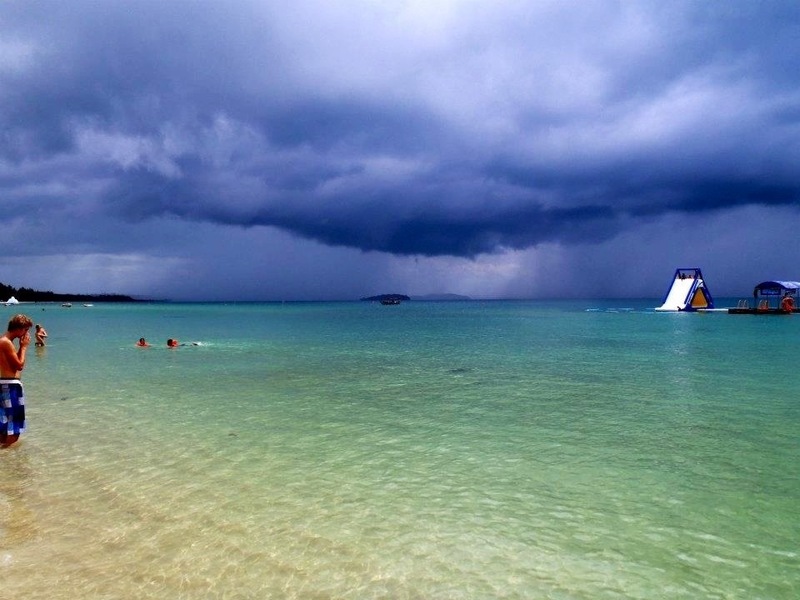 The clouds moving in foreshadow the quick change that is about to occur in the beachside town of Sihanoukville. From full beaches and people frolicking in the water. Restaurant and bar service being predominantly on the beach lounges out the front. To a mad rush of people packing up their belongings and trying to find shelter inside the restaurants/bars. That’s the story for some. Those stormy clouds did not deter the local kids from using one of their free passes to the floating playground. So we embraced the rainy moment and went to play with the kids. Very nice picture, Sihanouk Ville is a beautiful city with very nice beach.